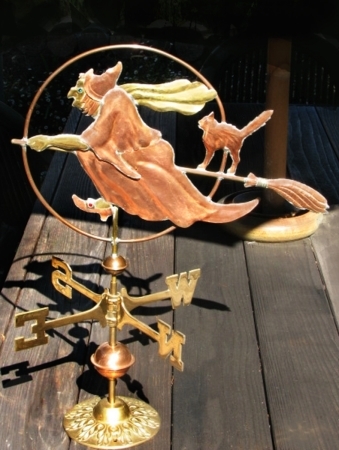 One of our favorite stories about this Witch with Cat Weathervane concerns a commission we received from a woman whose birthday falls on October 31st. Obviously, Halloween is a big day in her life! 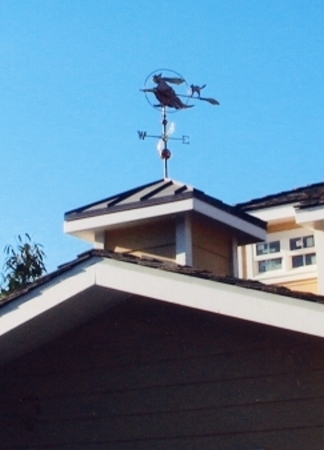 She was re-roofing her house and had the perfect turret on which to display her new weathervane. 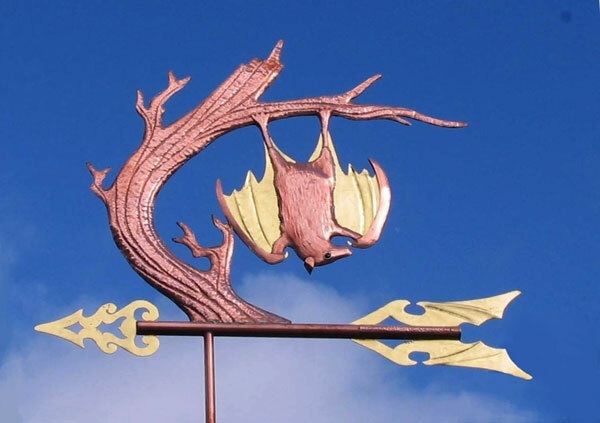 The roofers installed spot lights on the roof which she flips on at night, especially when the moon is full, so people driving by in darkness can see her witch silhouetted against the sky. 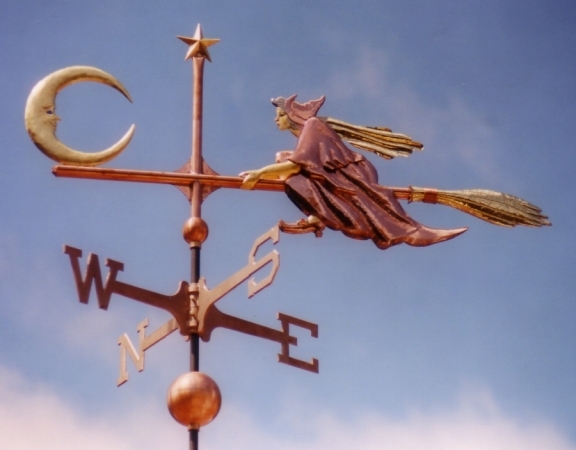 She later told us that her neighbors give directions saying things like, “We are the third house on the left, just past the house with the Witch on the roof”. 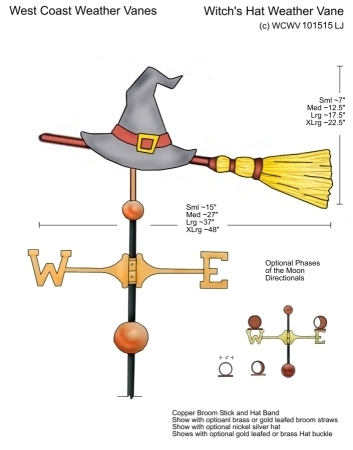 In this weathervane design the witch is based on the traditional old crone. 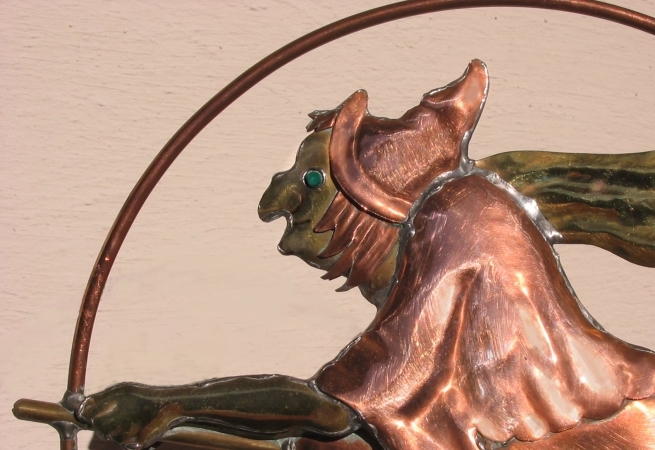 We have also made a version of this design where the witch is young and beautiful. 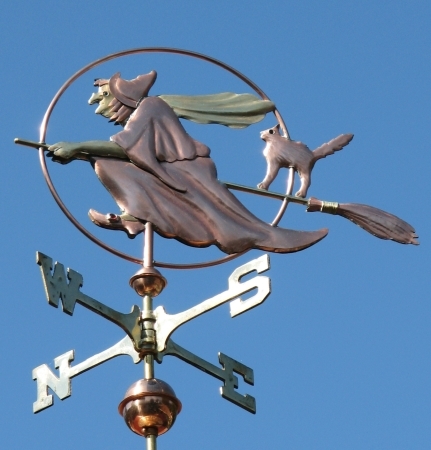 Here she has a long warty nose, peaked hat, brass buckles on her pointy toed boots, and is shown riding a broom. In honor of the infamous Elphaba, the Wicked Witch of the West from the Wizard of Oz, we have included red glass ‘rubies’ in her slippers! 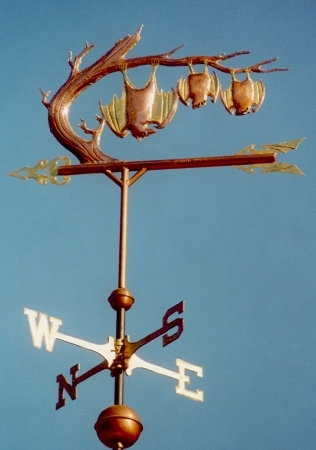 Her dress and cape billow in the wind as she flies through the air. 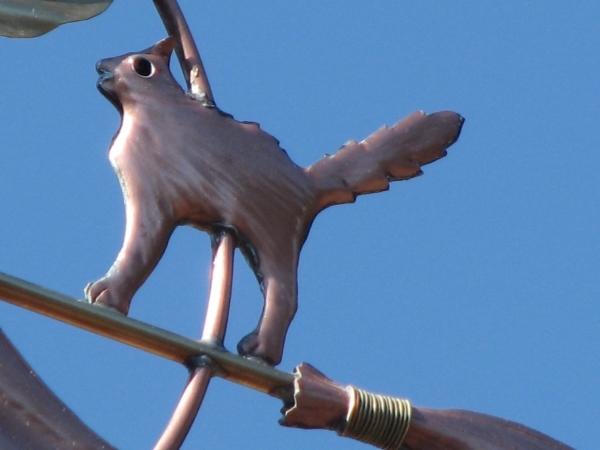 The scary cat, known consort of witches, is depicted with an arched back, a mouthful of fierce teeth and a fluffed out tail. 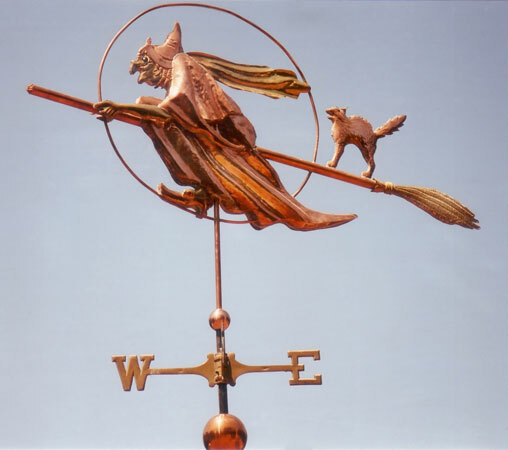 Because we craft every weathervane to individual order, we will work with you to select the metal combination that works best for your situation and style, and, if desired, help you choose translucent colored glass eyes for the witch and the cat. 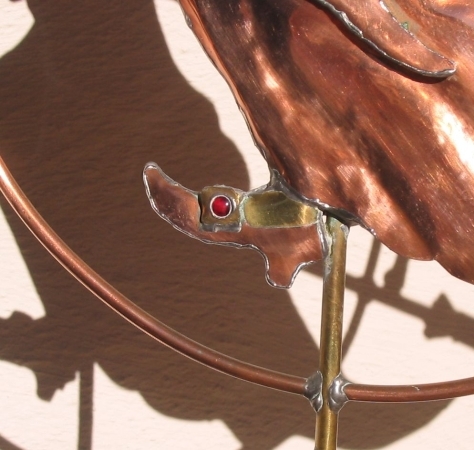 You are also welcome to include ‘lucky’ pennies, commemorating special years, inside your weathervane (from a weathervane making tradition that dates back to the Victorian Age) You may also choose to include a personalized inscription stamped into your weathervane for posterity. 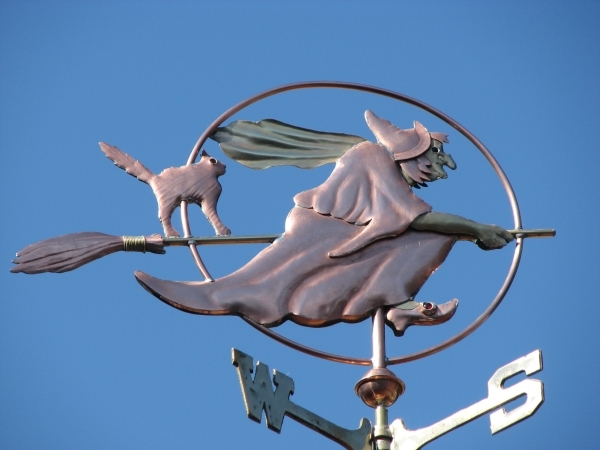 If your taste runs toward the Wizard of Oz , we can also make adjustments like replacing the cat on the broom with Dorothy’s Toto. 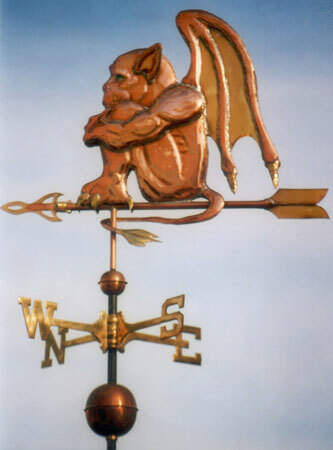 Along those same lines, I’ve always thought that with some slight modifications, our Gargoyle weathervane could be transformed into one of the famous flying Monkeys from the Wizard of Oz. 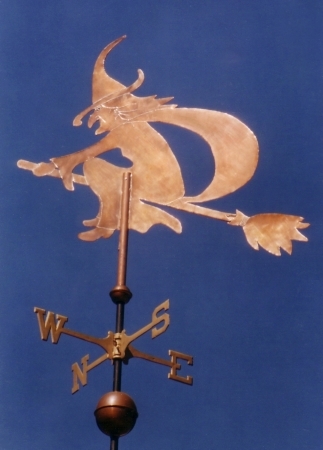 Imagine how cool it would look to have the Wicked Witch of the West up on the roof flying side by side next to one of her monkey minions! 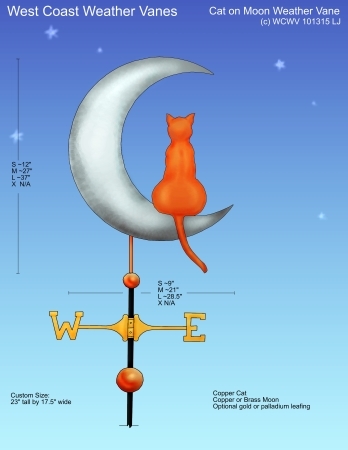 Even more amazing, would be to design a complete series of weathervanes around this storyline, including the Tin Man, the Cowardly Lion, etcetera. 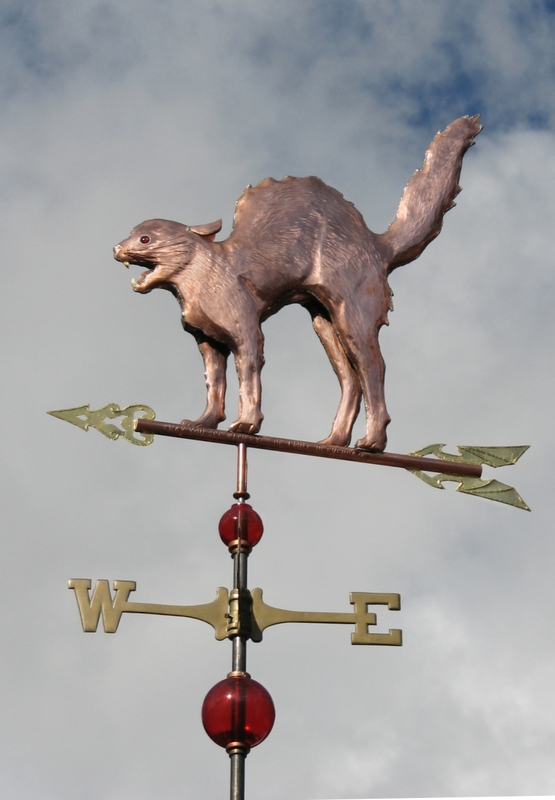 With our custom crafted weathervanes, your imagination has no bounds.